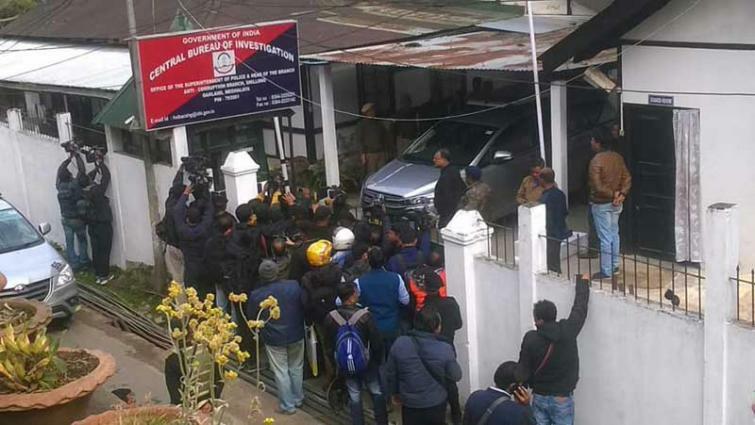 Shillong, Feb 11 (IBNS): The Central Bureau of Investigation (CBI) resumed interrogating Kolkata Police Commissioner Rajeev Kumar at its Shillong office since Monday morning for the third consecutive day over his alleged role in destroying and tampering with evidences in chit fund scam cases of West Bengal, officials said. Besides Rajeev Kumar, journalist turned former TMC Rajya Sabha MP Kunal Ghosh is also being quizzed by the Central probe agency in Shillong in connection with the same case. Earlier on Sunday, CBI grilled Rajeev Kumar and Kunal Ghosh separately and jointly for nearly 11 hours in connection with Saradha and Rose Valley chit fund scams. On Feb 3 (Sunday), a face-off between the Kolkata Police and CBI began after the premier investigation agency's officers went to Rajeev Kumar's bungalow in south Kolkata's Loudon Street area as the CP skipped three previous summons and city cops manhandled CBI investigators and forcibly detained them. Following the incident, West Bengal Chief Minister Mamata Banerjee sat on a two-day 'political' dharna (sit-in-demonstration) and other leaders of the opposition-alliance either joined the dharna or expressed their support over phone. Later, CBI went to the Supreme Court to get order to interrogate Rajeev Kumar and the apex court had directed the Kolkata commissioner to cooperate with the CBI and to appear before it in Shillong. A three-justice bench of the Supreme Court also directed the CBI that it could not arrest Rajeev Kumar immediately.